In Three Panels, Zainab Akhtar examines three individual panels from a comic book, analyzing how they contribute to and function within the narrative. A common criticism in comics is that the role of the art in the medium and its storytelling function is paid inadequate, or incapable, attention. The A.V. Club’s new feature Three Panels will address this critique by selecting a comic book, introducing it briefly with an overview of plot, and picking out three panels to deconstruct and discuss at length. How does the art build or contribute to the narrative? What is shown within these panels and what can be construed from those choices? It’s not an exercise in necessarily pulling out iconic, or even aesthetically pleasing panels, but to select panels that have caught the eye, perhaps look odd or interesting, and to break down why. We will look at technical aspects, composition, layout, angles, color, and if and how these components contribute to the overall tone, analyzing and writing about a comic from a slightly different, art-led direction. A two-issue Legends Of The Dark Knight comic published in October 1993, Batman Tao sees veteran writer Alan Grant once more team up with frequent collaborator and British master Arthur Ranson—best known for his work on Mazeworld, Button Man, and 2000AD’s Judge Anderson. The story leads the Dark Knight into Gotham’s Chinatown to investigate the extortion of various gambling clubs, where Batman finds he’s not the only person after prime suspect Johnny Khan. He encounters an old foe from his days spent as a young Bruce Wayne in China, so that he must now fight a battle on two fronts. This early panel of Batman standing/waiting for the police to arrive sets the tone in Grant and Ranson’s approach to Batman. He’s not skulking in an alleyway, or perching watchfully on a gargoyle: none of that overt dramatic flair. He is standing with his arms at his sides, palms facing down, at ease and relatively nonthreatening. He is, however, the only upright foreground figure, so compositionally still the largest, and most immediately focal, element. It doesn’t matter that he’s not centrally placed, as everybody else in the panel is either subdued on the ground or in the background. On the right, the police car fills in space to provide balance, while the positioning of the three neon signs similarly frames and anchors: left, center, right. It serves nicely as an establishing scene, an introduction even; you could open with it or pull it from context and it stands as a narrative. You don’t really need to know what’s gone before—there’s Batman, there’s a group of men at his feet he’s obviously beaten up, there’s the police arriving on the scene. It’s a very calm aftermath. Ranson balks at his work being labeled photo-realism, perhaps because labels lack nuance and differentiation, but photo-realism isn’t photo-referencing. One of the most fascinating, most pleasurable aspects of comics is the multiple artistic styles it encompasses, from the suggestion of an object using as few lines as possible to intricately detailed, meticulous vistas. Ranson’s style is an amalgamation of traditional European illustration with its fine lines and texture, but is categorized under photo-realism in terms of his ability to depict people, landscapes, etc., with immense, life-like accuracy. Photo-realism can often distance the reader: The closer, more accurate an illustration is to its subject, the greater the difficulty in finding a point of attachment with which to imprint or relate. In Tao, Ranson’s style achieves a balance that softens the “coldness” of photo-realism with a grounding, textured earthiness. While today’s “real” in comics largely equates to gritty, bleak, and dark, Ranson’s realism is empathetic, simply making things appear normal and everyday—in other words, “real” on a believable level. Here Batman is tall and athletic, but devoid of triple-packed, heaving musculature. Instead Ranson imbues him with presence and gravitas—a contained stillness, neither sullen or grim, but solemn. This ability and theme recur in his work: The tempering of the iconic, stripping away the flash and grandiose and replacing it with a sense of importance. This realism, when paired with Ranson’s artistic ability, somehow makes it greater. There’s humanity in his interpretation of all things, a point of comprehension and accessibility, regardless of how big, how encompassing, how good or bad a situation. Foremostly, you can always see the man in Ranson’s Batman. He’s real and tangible, and somehow that makes the prospect of him worse. Perhaps an innocuous image at first glance, the illustration to the right concludes a triptych of slim vertical panels. The first shows Batman getting out of the car and looking up—that in itself is an unusual angle, with a switching of roles, as the reader looks down on Batman from an aerial position, and he as a small figure looks upward, gauging length and line. It sees him vulnerable, left open, his neck and throat bare—a repeated stance in Tao. The second panel is an angled side-shot of him running across the rooftop, cape billowing, followed by this moment of repose. The colors are unusual—the lush greenery of the trees, the warm brick terra-cotta of the pagoda rooftops—a change of setting from Gotham’s relentless looming gray. It’s striking to see Batman in the light, which manifests a sedate peacefulness—Batman’s cape looks like it’s been caught by a breeze, and the sculpted architectural detail hints at romanticism—at odds with ingrained expectations of a more bombastic personality. His back is to the reader with no glimpse of his face. The objective isn’t to gaze upon Batman, but see and feel the moment as he sees and feels it, the emphasis more on the moment in itself, with the reaction derived from intaking those surroundings and suggestions gleaned from Batman’s body language. The union of repose and action is central to the story, which is structured around the philosophies of Taoism. The deliberation is lent to Batman’s movements: The reaching of a hand, an inclination of the head, attention to every gesture and decision, adheres to various Tao concepts. Every action creates counteractions, and being able to accept and react to these properly, without being misguided or diverted, leads to a better understanding of the self, and of life in general. A beautiful panel of Batman walking on a roped line, arms stretched out for balance against a velvety, rich blue-skied background and nothing else epitomizes this sense of carefulness, concentration, and poise. It feeds into the idea of him working to make himself what he is, to be better in order for his impact and actions to be better. The characterization of Batman here is in stark contrast to the much-mined “Batman teetering on the edge of madness” stories over the years, and the baffling, wildly see-sawing psychological elasticity within. Grant and Ranson’s focus on Batman as a man is a focus on Batman as whole: complete and pulled together. This is adult Batman. There’s no internal conflict—this is his path and way (definitions of the Taoist principle), a spiritual ideology placed for practical application. The goal of the Tao is awareness and harmony: an intuitive, evolving understanding of life, the objective of which is to refine the will with nature and everything around you to achieve clear organic reactions and actions. Batman’s path is ostensibly as similar as anyone else’s. In the face of overwhelming evidence of a world indifferent to injustice and pain, he harbors hope. Hope in good, hope in change, hope in meaning. He doesn’t necessarily view himself as good, or view good as an immutable characteristic, but a continued practice that requires maintenance and work. Even a superficial reading of this panel adheres to the Tao: Only by observing and knowing nature can you know yourself. Technically one panel, albeit a double splash page, depicting the penultimate fight between Dragon and Batman, this is another example of an interesting choice by Ranson and Grant. This image, and the inset strips running along the bottom of it, are the extent of the fight. In the main illustration, the basic connotations of the color psychology are revealing: the fiery red and orange flames of the dragon—implying hotheadedness, passion, and rage—are at battle with the cool blue collection (again reinforced and reiterated) of the bat. The vivid beauty of the background image demands the gaze—the teeth, spikes, scales, horns, and curled snarls. The background is where the fight really seems to be taking place, as Batman and Dragon stand perpetually anticipatory in their stances. One pair of hands raised, one pair low. The psychedelic green and white swirling background hints at how much of this fight is internal, psychological—resting on a state of mind. At the top, the open-hand-versus-closed-fist fighting styles mirror the attitudes of each character. Dragon’s yin-yang symbol melts and drips, obscured, while Batman’s is clean and full. Dragon is the one who is acting out of a place of hate, revenge, and jealousy, and thus lost to the Tao, even as Batman strives to implement it. They are distorted reflections of one another, each seeing in the other what could have been. The strip at the bottom depicting the fight is the last thing the eye is drawn toward, but its inclusion speaks to its relevance. 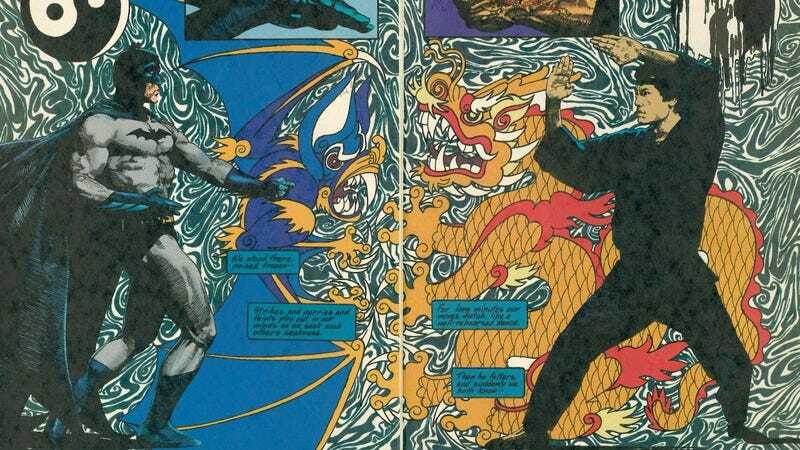 The panels begin lighter and clearer on Batman’s side, and gradually darken and become indecipherable as they continue to Dragon’s page, before tearing and bleeding out. The outcome is never in doubt. In a book where Ranson presents small moments of significance built upon one another, here he presents the moment in which the legend flickers into view: Batman writ large, the stuff of myth once more.